An event about online reputation which attracted more than 300 people was held in Mulhouse on 15 June 2012. Because of its hyper-connected audience, this conference day hosted by famous stakeholders produced lots of tweets, so much so that #erepday quickly established itself as a trending topic for France. This Actulligence Consulting collected more than 2,350 tweets on the topic between the morning of 14 June and 4 pm on 16 June and mapped them. We set out for you below some results from this task which is typical of what we do for our clients. The first map produced enables us to view the most active accounts for the event and to follow the impact of their posts by the conversations that were initiated between them. 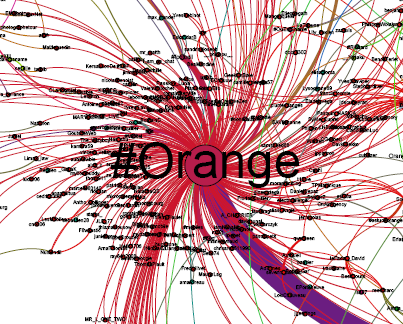 Each of the points of this map represents a Twitter account and the links between them show the tweets exchanged. The filtering that was carried out enables us to focus on the most active accounts without bothering with accounts that were posting to a lesser extent. The most active accounts are immediately apparent and we can observe their influence from the number of successive retweets of their messages (length of the chain). The influence of retweets is assessed by the number of interactions they have with people reading and interacting with them. The second map produced has not been subject to any kind of filtering. We’ve just shown all the Twitter accounts. We find the Twitter accounts that produced the most interactions around the edge and those which generated very few interactions in the centre (even if they’ve posted a large number of tweets on our topic). Above all, this type of view enables us to assess the number of Twitter accounts which fit into a system of interactions and influence, and to assess at a glance the proportion of accounts really embedded in the ecosystem into which the brand fits. Here we are at an event which for a start is of interest to an existing community strongly linked to the same theme, the same topic. On most maps of major consumer brands, the gap between integrated accounts and separate accounts is much greater in favour of separate accounts. 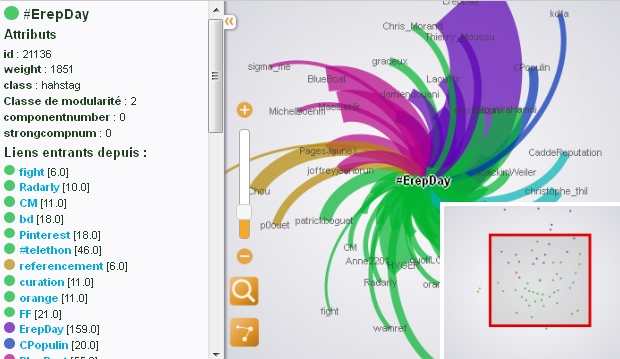 Another part of our map analysis model enables us to display the hashtags included in collected tweets. We can thus map the relationships between hashtags and Twitter accounts. On this map we therefore find points representing both hashtags (preceded by a #) and accounts. Here we observe the central position of the #erepday hashtag, which is quite usual as the term erepday was our main collection criterion. We note above all the the high density of tweets around this hashtag, revealing the consistency of communication carried out. We can also confirm that the most active accounts are those which use the event’s official hashtag the most. Finally, to navigate inside the collected data we offer you this map navigation tool, to which our clients are offered access for one month for each map supplied.